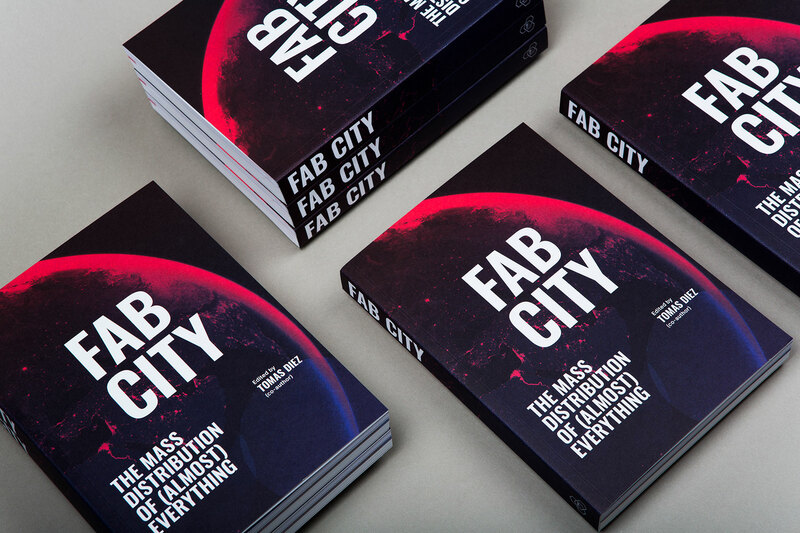 This is the title article from the book Fab City: The Mass Distribution of (almost) Everything. The book focuses on the power of human-centred technology to transform urban environments and our socioeconomic systems with particular focus on theoretical and practical experiences that bring about systems change through the distribution of access to tools and knowledge. The book was launched at the Fab City Summit, Friday 13 July 2018. Thousands of years ago, human agriculture made excess production possible. This led to the increasing accumulation of goods, the concentration of people in towns, and portended the end of the hunter-gatherer. Later emerged a system to organise the exchange of services and products at an abstract level: money. Today’s economy is based on the flow of real and fictitious money, which simplifies the value of assets, skills, people, resources, and almost every element of reality. Money has become a means and an end in itself. If the rise of agriculture dramatically transformed the way in which humans inhabited the planet, now the monoculture of money is threatening life itself. Our economy is based on the premise that we have a limitless planet at our disposal, thus allowing us to focus, laser-like, on a single, all-consuming objective: accumulating money — as much of it as we possibly can. What makes the monoculture of money possible is, on the one hand, control over the access to information (the Internet is being hijacked, in case you hadn’t noticed) and, on the other hand, the concentration of the means of production: energy, agriculture, and the objects and tools that allow humans to survive and make the most of their habitat. The management (hijacking) of physical assets and natural resources is organized by means of other abstractions, such as legal systems, economic laws, and models backed by national governments and corporations. If we were to democratise the means of production and make them accessible to all, and if we were to own — and protect — our digital information, we would be challenging the very foundations of the current economic, political, and social structures. Purpose, meaning, and ownership are keywords to keep in mind when talking about the impact that future technologies are going to produce in our lives. The conversation is not really about the technical capacities of Virtual Reality, Artificial Intelligence, Augmented Reality, Machine Learning, robotics, quantum computers, automation, or synthetic biology, or even about their profitability. What we must ask ourselves is: What purpose do these technologies serve, and for whom are they useful? Who decides how they should be deployed? And how much do we really want to know about them? These are the questions that will motivate individuals, communities and organisations to collaborate in proposing and building new ways of owning and using technology, and of putting it in service of human and ecological values, so as to allow us to coexist in harmony with the living systems of the planet. Beyond predicting the future, we need to reinvent it to meet the pressing social and environmental challenges of our times. At the Fab Lab network, we’ve spent more than a decade researching the role of technology in society and developing new programs and projects aimed at creating a new productive and economic model. The first Fab Lab outside MIT was created more than a decade ago by Mel King at Boston’s South End Technology Center (SETC), in collaboration with MIT’s Center for Bits and Atoms, under director Neil Gershenfeld. Mel’s vision was to harness the lab’s technology to breathe new life into a neighbourhood that had long suffered from racial segregation and economic deprivation. Decades before that first lab in Boston, Jane Jacobs warned about the negative consequences of mass urban development, driven purely by economic gain, in New York. In one of the most famous clashes in the history of city planning, activism, and sociology, she stood up against market interests, embodied by Robert Moses, who put profit above the common good of residents, neighbourhoods and cities. Jacobs was a fierce defender of the idea that cities be devised by citizens and that market dynamics and so-called “progress” were killing cities’ DNA. Sadly, that same urban model that Jacobs railed against is still driving city development today. And the kids of Boston’s South End were its victims. Acting in conjunction with the local community, Mel decided to take action by providing educational programs and access to technology to neighbourhood’s black and Latino teens, who were struggling within the constraints of the “normal” educational system. SETC has been operating for around 15 years now, offering Boston kids free workshops and encouraging them to develop their creativity. Mel’s lab has served as inspiration for hundreds of labs around the world that emphasise social dimension of technology. Fab Las are sometimes are accused of being are elitist, or too MIT-centric, or dismissed as places only for nerds, but Mel King belies all those stale preconceived notions. In addition to his work at SETC, King has organized Sunday brunches at his home for the past half century, giving the community a space to sing, discuss and debate issues, or even just get together to read poetry. Can a Fab Lab help rebuild communities and generate new economic opportunities for everyone? The first Fab Lab in Europe opened about 11 years ago in Barcelona’s Poblenou, a post-industrial neighbourhood that was once known as the Catalan Manchester for the strength both of its manufacturing presence and its labour union organizers. Like many other historically blue collar neighbourhoods, Poblenou has hard-hit by the deindustrialization process of the last quarter of the 20th century. The devastating economic crisis that started in 2008 only made things worse, putting in jeopardy the so-called [email protected] urban renovation plan, which Barcelona’s city council devised to stimulate real estate investment in the area. The 2008 crisis dramatically reduced the options for capital investment in Barcelona, and the real estate market in Poblenou did not boom as expected (although certain university departments did ultimate move in, as did a few large corporations.) But then, new creative industries such as design studios, small architecture and design schools, and digital production businesses began to pop up. Art galleries and collectively occupied buildings soon followed, and the identity of the neighbourhood began to change, with Poublenou garnering comparison to Brooklyn, Wynwood, and Mitte. It also soon began to suffer from the same problems of gentrification that have afflicted those areas. Poblenou is now evolving into an ecosystem where different initiatives are giving it a new, unplanned identity that has emerged as a result both of the economic crisis and the obsolescence of traditional planning. The neighbourhood now has a private-initiative association (Poblenou Urban District) which brings together most of the area’s creative industries, maintains the communication flow among its members, organises events, and promotes Poblenou’s potential to the city and beyond. In Poblenou, Fab Lab Barcelona and Fab City found the perfect context in which to settle and grapple with the future of technology and its potential impact on society. Additionally, the Maker District, which was recently launched as part of the Barcelona Digital Plan, promises add a rich new layer to the existing dynamics of the neighbourhood. The Maker District was conceived as a collaborative and co-created process aimed at building the Fab City project’s vision, in conjunction with the local community and the global network. It was envisioned as an experimentation playground to design, make, test, and iterate new forms of governance, trade, and production at the local (neighbourhood) level, using advanced technologies to accelerate the process of making cities more resilient and inclusive. At the city scale, Fab Lab Barcelona is leading the development of the Fab Labs public network: It advises the city council on building the first infrastructure layer for the Fab City, as described at length in the project’s white paper. Located in four different districts by June, 2018, the newly named Ateneus de Fabricació are still defining their operation principles, deciding between two operation models: a) being bureaucratised by the city council machine, or b) becoming an avant-garde force for innovation in public policy matters. For the moment, this remains an open question. Beyond public intervention in the Barcelona innovation ecosystem, private initiatives have been flourishing and finding ways to create business opportunities both in Barcelona and throughout Catalonia through spaces such as Makers of Barcelona, TEB (which is very similar to the SETC model in Boston), Tinkerers Lab, Beach Lab, Green Fab Lab, and the BiblioLabs, to name just a few. These spaces make technology accessible to people and businesses in different ways, by connecting it with existing co-working activities, social action initiatives, or educational programs. We’ve also been exploring an interesting new model for creating new labs: public-private partnerships. Instead of city council trying to concentrate innovation and spending millions of euros in new buildings, less than 30% of that investment could instead be directed toward private initiatives that are already happening in the city. These initiatives, in exchange, would offer open school programs, free educational workshops, and address unemployment by teaching new skills. Public and private investment in new digital production technologies in Barcelona is acquiring a larger dimension with the emergence of the 4.0 Industry, which aims to digitise large-scale manufacturing processes. The 4.0 Industry is widely — but inaccurately — seen as shorthand for the Internet of Things and 3D printing, which are some of the emergent technologies that will complement manufacturing processes. The new industrialisation of cities must look beyond the techno-centric view and invest in bringing technology closer to people. At the same time, in order to remain relevant in a context of distributed production, industries should abandon the traditional extractive model, which puts them in the role of “takers” instead of “enablers.” On the other hand, the public sector might want to experiment with less-controlled models of nurturing new business, employment and innovation forms, without having to spend millions on infrastructure. In accordance with this logic, the Catalan government is launching the CatLabs initiative as a way to create mechanisms for enabling the creation of a larger ecosystem in the territory, and understanding the “lab” model as a perpetual way of operating. In our constantly changing world, innovation is not an option. It’s a necessity, in order to keep improving our operations and remaining relevant within the fluid economic context. Barcelona’s unique ecosystem is being used as a prototype for new forms of production in cities like Paris, Santiago, Amsterdam, Shenzhen or Detroit, as well as in countries such as Bhutan and Georgia. These are, of course, all places where the Fab City has been adopted and replicated, with a dash of local flavour — places where this networked global community is building a new productive and economic model for the future. With the emergence of new forms of politics in the context of the so-called liquid democracy, we might just be at an interesting turning point for traditional governance in cities — which have long had strong public presence in almost every sector, challenged only by central governments or large corporations. In a new iteration of democracy, participation should not be merely about giving an opinion or delegating power to elected representatives, but about co-creating and co-building neighbourhoods and cities. The risk here is that, in high-level power struggles (city, region, country, corporations), the other players (citizens, communities, small businesses) will be left to navigate uncertain waters and ever-changing rules of the game, and the personalisation of power. Without institutional infrastructures enabling new productive city models, we are in danger of repeating the same mistakes that the existing extractive, market-driven economy has made, only now at the hands of the public sector or new forms of private businesses. We have the opportunity to test new forms of governance, including all relevant players in a fair and transparent way, by harnessing technology as a tool for making the transition to a new economy — the transition to the mass distribution of everything (including democracy, participation, responsibility, and governance). The concepts outlined in the above article explore the contextual field in which the Distributed Design Market Platform seeks to connect makers and new markets and furthermore, engage the existing maker movement and design fields with the benefits of a distributed design market.